Which poet of the past should we turn to as we look back on the traumatic year that is drawing to a close? Throughout much of 2016, W.H. Auden seemed to many the obvious choice. Fearing where the current tide of angry nationalism could lead, many commentators, including Neal Gabler and Cynthia Ozick, singled out “September 1, 1939” as a twentieth-century poem that spoke powerfully to our current twenty-first century tragedies. The poem, which has been downloaded from the web tens of thousands of times this year, refers to “what dictators do” across “the darkened lands of the earth” — these and other phrases resonate today. There is a third great poet, however, who seems to me worth re-reading while reflecting on 2016. The poet is Rabindranath Tagore, who in 1913 became the first Asian writer to win the Nobel Prize. The less weighty reason to focus on Tagore now is that much was made this year of the novelty of a songwriter becoming a Nobel Laureate. Bob Dylan was not, however, the first one to get this prize; that distinction, as Amit Chaudhuri noted in the Guardian belongs to the Bengali poet Tagore, who wrote many songs as well. The more substantial reason to associate Tagore with 2016 is the renewed relevance of his “Sunset of the Century,” which was written on the final day of 1900, a year during which wars, humanitarian crises, angry nationalist rhetoric, and a diplomat’s assassination all made headlines. The diplomat killed in the year of Tagore’s searing poem, which speaks of a time when the sound of the “clash of steel” filled the air, was Baron Clemens von Ketteler. The Baron was the German Plenipotentiary to China. He was slain in broad daylight in Beijing in mid-June, just before anti-Christian militants known as “Boxers,” backed by soldiers of the Qing Dynasty, laid siege to the foreign legation quarter of China’s capital. The combination of the assassination and the siege, which famously lasted 55 days, triggered an international invasion of North China that ended up costing the lives of tens of thousands of people, most of them Chinese villagers with no ties to the Boxers. On December 31, 1900, while Tagore wrote “Sunset of the Century” in India, a crowd of people from different countries gathered on the other side of the Himalayas to see von Ketteler’s killer decapitated in a public square. The poem, which Tagore wrote in Bengali, is filled with phrases that could easily have been inspired by 2016 news stories. It refers to people “howling verses of vengeance,” of the “drunken delirium of greed.” The poem evokes a time when the “self-love of Nations” triggers a “whirlwind of hatred.” Tagore writes of watching the last sun of 1900, which was also the “last sun of the century,” sinking into clouds that, befitting the times, were of a “blood-red” hue. Back in July, when 2016’s status as an annus horribilus was already clear, Slate’s Rebecca Onion asked ten historians to propose candidates for the worst year in history. Some looked back many centuries, while those who focused on the recent past chose years such as 1919, when “The Second Coming” was written, and 1943, when the “dictators” of Auden’s poem carried out some of their darkest deeds. No one mentioned 1900. When that year began, a large-scale famine was underway in India and China and the Boer War was raging in South Africa. In the spring, the Boxers — who blamed the presence of a foreign religion for angering local gods and causing these deities to withhold much needed rain from the drought-parched lands of North China — murdered missionaries and Chinese Christians. At various points in the year, wars were fought in other parts of the world, including the Philippines, where Tagalog rebels and American soldiers clashed. The summer saw intense fighting in China between Boxer and Qing forces, on one side, and an international army made up of soldiers marching behind eight different foreign banners, including the Stars and Stripes, the Union Jack, and the Japanese and Russian flags, on the other. In 1900, as in 2016, a new communication technology was used to spread false information. The most important example then of what we now call “fake news” was a widely circulated and for a time widely believed report of a mass killing of the foreigners held captive in Beijing, which had allegedly led to the death of all diplomats and their wives and children. This incorrect report began with one cabled story, disseminated via telegraphy, a medium that had been invented decades before but had just gained added importance when the first undersea cables were laid. Soon, newspapers on both sides of the Atlantic, as well as in other parts of the world, were presenting the rumor as truth. Eventually, when the international forces lifted the siege, the foreigners who had been held hostage emerged very much alive, but the horror generated by the rumor of their slaughter had an important effect. When the stories of Beijing’s streets running with blood circled the globe, it stoked the outrage generated by factual reports of the Boxers killing Christians and von Ketteler’s assassination by a soldier. Even though the stories had been proved untrue before the international force reached Beijing, memories lingered of the loud calls for retribution heard while the rumors were taken as fact. Many had been insisting, even before the rumors flew, that China and the Manchu dynasty that ruled it, which had decided to back the Boxers, needed to be taught a lesson they would never forget. But the fiercest prose equivalents of the “verses of vengeance” alluded to in Tagore’s poem were issued while images of rooms filled with slain diplomats and their family members were in people’s minds. Some insisted that Beijing should be razed to the ground, and a European newspaper said that “exemplary vengeance” should be the order of the day once the international army reached the capital. In the end, while Beijing was not completely destroyed, there was wholesale looting of imperial treasures and the campaigns of retribution subsequently staged across North China could be seen as “exemplary vengeance” of a sort. Donald Trump’s tweet presenting the December 19 “terror attacks in Turkey, Switzerland and Germany” as being of one piece, despite the different targets and actors involved, fits in with the 1900 speeches by Roosevelt, a future resident of the White House. So, too, did the President-elect’s appeal to the “civilized world” to respond to the violence. There was even a 1900 analogue to Trump’s past efforts to associate his domestic opponents with terrorism. The cover of the August 11, 1900, issue of the magazine Judge showed three figures standing side by side, each with a plague reading “I AM AGAINST AMERICAN IMPERIALISM” across his chest. On the left, a menacing looking Chinese Boxer, on the right, a Filipino rebel with a fierce expression, and in between, Democratic candidate William Jennings Bryan. In 1900, as in 2016, there were those who insisted that it was wrong to see the violence wracking the world as a simple struggle between “savagery” and “civilization,” with all Christians on the side of the angels in all disputes. Mark Twain, for example, expressed sympathy for the Boxers, seeing them as patriots, and drew attention to atrocities committed in the name of “civilization,” as foreigners, including missionaries, looted Chinese national treasures, and international troops rampaged across North China. He also chastised Christendom for besmirching its reputation through acts no better than “pirate raids” in the Philippines and South Africa as well as China. Tagore’s “Sunset of the Century,” by blaming the “self-love of Nations” and a “drunken delirium of greed” for the era’s horrors, rather than seeing them as part of an epic battles between “civilized” and “savage” groups, expressed views closer to Twain’s than Roosevelt’s. In 1900 there was a sense that so many different things were going wrong that the end of the world might be at hand. Writing home from China during the Boxer crisis, one missionary mused that she felt “as though these were the last days,” due to the sufferings around the world caused by “wars, famines, rumours, persecutions!” 2016 witnessed references to specific events as having an apocalyptic feel to them, as well as dark reflections on the year as a whole, including the way it moved us closer to a climate change doomsday scenario while reviving worries about a nuclear Armageddon. It is possible to take comfort from the knowledge that previous generations have felt that end times were near. There is such a feel of familiarity to the problems Tagore describes in “Sunset of the Century,” though, that reading it now leads me in a different direction. He and his contemporaries thought of the day he wrote the poem, December 31, 1900, as bringing the nineteenth century to a close. It was possible to imagine that narrow forms of nationalism, fear of the foreign, and other things that had caused such misery during the previous months would soon be seen as problems of an age gone by. 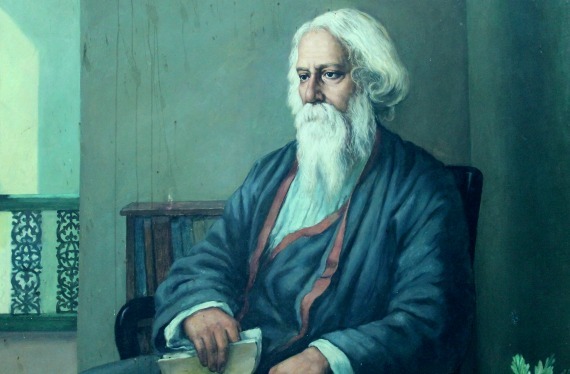 If we move forward from Tagore’s poem to the famous ones that Yeats wrote in 1919 and Auden in 1939, we see that the phenomena the Tagore felt had marred the nineteenth century continued to do an enormous amount of harm in the twentieth. And if we focus on the years just ended, we find clear evidence that, due in part to the continuing power that “greed” and the “self-love of Nations” can exert, we live in a twenty-first century when the “howling” of “verses of vengeance” often fills the air. Jeffrey Wasserstrom is Chancellor’s Professor of History at UC Irvine, where he also serves as Historical Mentor in the Literary Journalism program, and a co-founder of the institution’s Forum for the Academy and the Public. He published two books in 2016, one as editor, The Oxford Illustrated History of Modern China, and the other as author, Eight Juxtapositions: China through Imperfect Analogies from Mark Twain to Manchukuo. He is currently writing a book about 1900, focusing on the global impact of that year’s crisis in China. Allow the story to bring you back to the temporary innocence of July and August. Experience the deep melancholy of its final paragraph as you get ready for the cold months ahead, but don’t worry: there is always next summer. Well said! Unfortunately the parallel to the contemporary situations seems quite appropriate. And many thanks for all the interesting links! 'Dispatches' is Herr’s final draft—he never came back and said, “What I meant was…,” or judged his experience against another’s, or said “I told you so.” I am envious of that ability to take himself out of the game.